I haven’t written much lately, I guess I’ve been busy… mostly with two things: Cancer & Ceptr. Currently, my time is about living with a spouse with stage 4 metastatic breast cancer and all that it takes to support her as well I can. My work is about building tools for a post-monetary society; creating a new meta-language to allow a vast expansion in social forms that is currently limited primarily by the world’s current statement of value: money. These two worlds have recently come together in ways worth writing about. Wh en describing my work-in-the-world, people are always asking me for more examples. Because abstract descriptions like the one in the paragraph above don’t really do it for folks. I get it. But it’s hard for me! When what you are designing is like grammar for a kind of language that doesn’t exist, it’s pretty hard to give examples of sentences in that language, because it doesn’t exist yet! But there are openings into what that language looks like and what it might feel like to “speak” it. Here’s the one that comes from the intersection of my two lives. It’s called DST (Death Straight Talk). In the post-monetary world, value coordination isn’t reduced to a unidimensional bottom-line of money. We actually already live with one foot in that world. We are swimming in non-monetary current-sees like grades, credits, degrees, e-bay/Amazon/Uber ratings, food certifications of all sorts (USDA Organic, Fair-Trade, Non-GMO, etc)–the list goes on. We just normally don’t recognize them as “parts-of-speech” in a single “language.” When we do, new things become possible. This is what happened to me around DST. Pretty much everywhere I go now I look at the world through the lens of seeing all the information token systems we use to coordinate our actions. Movie and train tickets are current-sees, so are postage stamps, and buy-10-get-1-free coffee cards, intake-forms, passports, and licenses, the list goes on and on. I look for the current-see life-cycle, the issuer, the redeemer, other co-functioning current-sees, and I look for the level of wealth the current-see corresponds to in our living systems model of wealth. In December, Ellen got diagnosed with malignant pleural and pericardial effusions, which required hospitalization to get drains inserted to relieve fluid buildup in the sacs around her lung and heart (cancer cells muck up the usual flow paths). While in the hospital a protocol around a slightly lowered blood sodium level involved giving her “some fluids.” Seemed innocent enough. Well, in Ellen’s case, those IV fluids ended up causing pretty extreme swelling in her feet (she renamed her feet manatees). The swelling was bad enough on its own, but due to neuropathy from previous chemotherapy, meant that thereafter walking was almost impossible due to the pain in her feet. It took three weeks for the swelling to go down, and for Ellen to do more than hobble. This had a cascade effect on loss of muscle which still hasn’t returned. It’s pretty clear to me that the protocol that triggered the IV fluids didn’t take into account increased swelling risk, that, it turns out, comes from protein loss from pleural fluid drainage. I really doubt it took into account added pain due to neuropathy. And I know for certain that it didn’t take into account quality-of-life assessment around the questions of balancing risk of loss of mobility for a person possibly in the last months of their life, because no-one asked. At the end of January, I went to California to help co-facilitate a workshop on Deep Wealth Design principles. On the last day of my trip, I got word that Ellen was back in the hospital again. After the previous hospitalization we had talked lots, and felt pretty good, about how to communicate with the medical world about her specific risk around IV fluids to prevent immobilization by swelling. But this time around there was much more going on. The short version: I could tell that lots of hospital protocols weren’t going to take into account Ellen’s situation, and what she wanted given her prognosis of limited life span. Then it hit me, probably because I was primed by the workshop: Medical staff have a current-see that they know how to pay attention to, the Do-Not-Resuscitate order (DNR). And it’s issued by the patient! I knew we need something like that, and that I had to have an acronym to refer to it. That’s how DST came to be. The rest of the story you know from my post on Ellen’s blog, but from a current-see perspective here’s the take-home: Adding a token issued by the patient allows re-evaluation of risks built into other protocols based on that patient’s stated understanding of what will create well-being for them. Note that DST so far isn’t a real current-see, because, unlike a DNR, there’s no social agreement on its issuance, use and life-cycle. But just my words to nurses “pretend like she has a DST sticker in her chart” made it work as if it were. It connected the main current-see hospital staff has to work with, the chart, with Ellen’s particular place in the flow. It’s a pretty powerful example of the effect of current-sees on social systems, and my own beloved’s well-being in the midst of them. I want this story to give you a visceral sense of how the social body gets built out of the formal information tokens we create Yes, underneath it’s the humans and their compassion and love and all that great gushy stuff that really matters. But the social body is built out of communication tokens and the agreements around their use –things like DST. We will lose what really matters if we don’t understand this. When we understand it, really and deeply, then we will also develop a kind of “language”, that can all “speak” to allow us to spin up various DST-like current-sees, and to evolve them on the fly. When we have that new “language,” then we will have stepped fully into the post-monetary world. That’s why I work on Ceptr and the MetaCurrency project. A few days ago I stopped at a gas station. As I was pumping, I noticed a vole scurrying across the parking lot. The lot was covered with a thin layer of that dry compacted, dirty snow that you get when it’s been cold enough that the snow never melted or turned ice. The vole would zip along for about six feet, and then try to burrow under a clump of snow, only to hit pavement so it would zip another few feet and try again. It had come from behind the gas station where there is a field, and it was headed in the direction of a very busy road. This vole was in for trouble and I’d better do something about it. I was half way through pumping so I finished filling my tank and then turned to see what I could do for the creature. By the time I’d spotted it again, it was about twenty feet from the road. I headed not towards the vole, but at an angle that would cut it off from the road so I could shoo it back to the field. But it must have know that I was trying to prevent it from moving towards its intended direction because it immediately headed for the road at a modified angle calculated precisely to avoid me. Within seconds the vole was in the middle of the road. The first semi missed it by five feet. The next one flattened it. I don’t know if the vole would have gone on to the road had I not tried to save it, probably it would have. But I do know that if I had stopped pumping gas right when I realized that this vole was in for trouble, that I would have had a much better chance of saving it. I hate pumping gas. Every time I do it, I feel like I’m that vole flinging myself and my fellow humans as fast as possible right toward those tractor-trailer truck wheels. The vole’s consciousness doesn’t even include roads and trucks, but unlike the vole, I know about peak-oil, and global warming. I can see the truck coming. But why didn’t I stop pumping for that vole? Why don’t I stop pumping for all us? How conscious can I become? I decided to register for Edgeryders after reading this post of Vinay’s. Clearly there’s an affinity of sentiment between Vinay’s post, and mine from that blog post, but that’s not why I signed up. Instead it’s because I’ve been struggling with that sentiment for many years, and decided to take the “Share your Ryde” mission as an opportunity to continue with that struggle. There’s something that feels righteous about “being willing to face the facts,” about not being in denial about how bad the situation is. It feels responsible, and grown-up. It feels like honesty, like trying not to be self-delusional, as well as being willing to take a stand. All these are attributes I strive for. But my struggle, is around being responsible not only to what is now, but also to what can be, to what is possible. In his post, Vinya writes: “If you’re not aware of this situation, I guarantee you it’s because you’re not paying attention, alas.” That’s a great rhetorical flourish: “If you’re not X, it’s because you’re not paying attention.” Makes me really want to be X because the last thing I want to be blamed of is “not paying attention.” But in attention lies the rub. There are different qualities of attention that yield awareness of facts (how things are), and of possibility (how things might be). Opening #1: In 2003 my father gave me two books to read: Interest & Inflation Free Money, by Margrit Kennedy, and The Future of Money by Bernard Leitaer. For me these books were one-way doors. Once I’d stepped through, there was no going back, because suddenly I understood three things: 1) money was a human invention 2) this particular invention is foundational to all human social patterns 3) we can change it, and there-by change our social patterns. Thus, I became open to a huge new possibility. The consequence of this opening was two-fold: first, that I became involved in a local currency project (one that never got off the ground), and second that I was invited on the board of the E. F. Schumacher Society, a small non-profit that for decades had quietly been working on many decentralist economic efforts, including local-currency efforts, which has now grown and become the New Economics Institute . In 2004, the Schumacher Society held what I consider to be a pivotal conference called Local Currencies in the 21st Century. Plenary speakers at this conference included both Kennedy and Leitaer (authors of those two books), and also Tom Greco, but most importantly for me, it’s where I met Michael Linton, Jean-François Noubel, and Arthur Brock. Opening #2: Michael Linton. I knew of Michael before the conference from my reading, as he is a pioneer in the community currency world, well know for his design of LETS, one of the most widely deployed community currency patterns. But at the conference Michael was talking about his ideas for open money. I daresay few people at the conference then, or since then, have understood the import of what Michael was sharing. He was explaining, as a unified vision, the necessary aspects of how the structure of money could to change. Namely that 1) money is information, 2) the pattern of flow of that information in relation to communities should be circular, i.e. issued within the community so it would flow around it, not through it as happens with moneys issued outside of communities. 3) That there must be a rich ecology of currencies appropriate to each communities circumstances. 4) That these currencies must exist in the context of a network that emerges out of an interplay between communities of function (what people do together) and communities of identity (how people see and name themselves). Michael was the first person I met who was thinking coherently on this level and actually trying to build a system that addressed these issues and was designed to scale. Over the next few years I came to work closely with Michael on the open money project. Opening #3: Michael introduced me to Ashby’s Law of Requisite Variety, and to Reed’s Law of Group forming Networks. These two “Laws” are both fascinating and deep, and they clearly apply to money and currency systems. Single national currencies fail to provide the systemic regulatory variety necessary for a healthy economy. Also, a multi-currency network would be an incredible group-forming network. But the real opening for me was not so much in the laws themselves, but in that they both point to the fact that in networked and cybernetic systems, new ways of thinking are necessary, and the results are surprising and non-intuitive. Opening #4: Jean-François Noubel. At the Local Currencies conference Jean-François was sharing his work on Collective Intelligence. This work identifies and describes the evolution of the forms of collective intelligence from “original collective intelligence” through where we are now, which he calls “pyramidal collective intelligence,” on to the possibility of “global collective intelligence.” In his work, Jean-François also focuses on “invisible architectures,” those patterns that, mostly unconsciously, regulate our lives. One of the most crucial that he identifies, of course, is the monetary system. Looking at the world through the this opening, the lens of collective intelligence and invisible architectures, gave me, and continues to give me, not only a powerful explanatory rubric for how things are now, but also where they might go. Consequences, phase I: I’m trained as coder (I have a B.S in computer science), but just before my father gave me the books that constitute opening #1, I had decided to give up coding. Over the years I had written a bunch of a good code that had made a bunch customers happy, but I didn’t feel like it was right. I wanted to be focusing on something that had a deeper impact. So I gave it up, and told my partner that I wanted out of our small dev shop. Well, after openings 1-4, I found myself right back in coding land. I knew that now I had the opportunity to try and implement software systems that could realize the promise of a new monetary system. This felt like impact. So this led to working closely with Michael to build a web-app that was pretty much to his open money specifications, and was meant to be a single server fully functional prototype to demonstrate what a networked multi-currency system would look like. That system is still operational and used in a couple of places. You can check the dev site. Opening #5: The levels of Wealth and their relation to systems. This opening was sparked by Jean-François Noubel, who described to me a taxonomy of wealth. He had realized that money is a tool that focuses on building tradable wealth, but that tradable wealth is just a small subset of measurable wealth, which itself is a subset of acknowledgeable wealth. What I realized, is that those levels exist because of systemic truths, i.e. that each level of wealth corresponds to levels of systemic integrity. That tradable wealth corresponds with parts and products of systems, and measurable wealth corresponds with properties of systems as a whole, and acknowledgeable wealth corresponds with relationships between systems. Here is where I first wrote about all this: http://openmoney.info/sophia/. Opening #6: Arthur Brock, flow and current-see. The opening about the levels of wealth came pretty much at the same time as I was also deepening my association with Arthur Brock who I had first met at the Local Currency conference. When I met him at the conference he was championing what he called “targeted currencies,” special purpose currencies for solving particular community problems, rather than general purpose exchange currencies. Arthur had been using the metaphor of the electromagnetic spectrum, comparing monetary currencies to visible light, when there was actually much larger range of currency “frequencies” that were available to solve other problems. But it wasn’t until I came to understand Art’s deeper definition of currency, as “current-see” or formal information systems that allows us to see and interact with currents, flows, that the things really came together. These different levels of wealth, corresponding to the levels of systemic integrity, also needed corresponding currency types, to manage the different types of flow that are taking place at those different systemic levels. The new system was working, and it was pretty easy to create mutual credit currencies, as well as reputation currencies, and if you were a geek you could configure other types of currencies too. But there was a big problem. Though I had made allowance for these different types of currencies, technically most of my focus was on laying down that social graph, the mesh. I hadn’t yet paid lots of attention to what the range structure of different possible currencies could be, and how I was going to integrate that. Opening #7: David Abram’s “Spell of the Sensuous.” Abram’s book provides an amazing account of how we’ve shifted the locus of meaning from the natural sensual world to human constructed one in the form of our abstract alphabet. The opening came while reading his account of the evolution of writing. That description opened my eyes not only to how currency is very much like writing, but that it’s also on a similar evolutionary track, going from a very concrete representation form, “pictograms”, to a much more abstract one, an “alphabet.” We think of modern money as very abstract, most often just bits in a computer. But what I realized, is that money is still very concrete, and just like pictographic writing. It’s not abstract at all because all moneys so far use the same encoding mechanism they always have for value: relative scarcity (just like all pictograms use the same encoding mechanism for meaning: shape) And that encoding mechanism is only really appropriate for tradable wealth where scarcity is true for parts and products of systems. It’s not appropriate for the wider levels of wealth. What I saw is that we have no “alphabet” for encoding all the levels of value, and that’s what the open money system I’d been working on could evolve into. I’ve written a couple blog posts about this if you want to read about it in more depth: here and here. Consequences, phase III: The rise of the MetaCurrency project, XGFL & the Flowplace. By this time, it was clear that I was interested in more than “money” because monetary currencies are those that apply to the smallest circle of wealth, tradable wealth. I was committed to working on what I was calling a “meta-currency” system that had a currency specification language that would be capable of representing wealth at all levels. So Art & I co-founded the MetaCurrency project to be a home for the tech protocols and know-how that would make this happen. Focusing on this problem from the currency-specification language point of view resulted in a design document that included the Simple Game Format Language (SGFL) which later became XGFL (X for eXtensible). This language was to be for currencies, as HTML was for web resources. At the same time I started working with Jean-François and Fernanda Ibarra who together wanted to a usable platform for groups of early adopters they were working with in the transitioner network who wanted to start living these ideas of multi-level-wealth currencies. So together we built the Flowplace. Here’s the demo site. The Flowplace implements the XGFL language, and at the same time includes a bunch of other important ideas necessary for actually organizing communities (what we called circles) around them and making them useful, the equivalent of a marketplace in the multi-level-currency context. Jean-François and Fernanda have used the Flowplace in a number of contexts and people have had transformative experiences as it can give a taste of a what a multi-level-currency world might look like. But from my perspective, as a system designer, this experiment, like my previous one, was a dead end. Where the Mesh & Churn didn’t have a native way to include currency specification, the Flowplace with XGFL, didn’t have a native way to relate currencies to each-other. We did do some important work on what we called membrane currencies to address this difficiency, but it just didn’t feel right, and I knew it didn’t have legs. Opening #8: The evolution of expressive capacity. Unlike all the other openings I’ve listed, for this one I can’t pinpoint its source. Of course it builds on all the other openings, but there’s not a particular person, conversation or writing or even moment that I can remember where it arrived. I think its the product of all of us working together around the MetaCurrency project. I now see that all the previous openings were partial views of this bigger pattern. So, yes, money is information, and yes, its evolution is like that of writing, but here’s the deeper pattern: It appears that the greatest leaps in “novelty,” i.e. increased possibility that we know of, all arise because of the emergence of new embodied information encoding systems, what I like to call “expressive capacities”. DNA, neurons, language, writing, the printing press, computers, these are all examples, at various levels of complexity, of such expressive capacities that allow for a explosion of possibility that is unimaginable before their arrival. Notice that though they are all “revolutionary” some of these new expressive capacities are more revolutionary than others. The invention of writing and the printing press are extensions of the basic expressive capacity of language. But the arrival of language and DNA are much more, shall we say, foundational. So here’s the crux of the opening: I see that we are at nexus point where new expressive capacity is ready to emerge that’s on the same “foundational” level as language and DNA. Our current day money is to that new expressive capacity as the coordinating hunting grunts of some proto-hominids is to language. Just as those grunts were somehow synthesized into a small collection of phonemes out of which an infinite number of words could be built, and which themselves are connected and organized into the subject-predicate grammar of human language, so is there the possibility for us to evolve away from that form of grunting we call money. What we can it evolve toward, is, for the lack of a better term, a language of flow. What this language expresses as an embodied information encoding system, is the equivalent of DNA, but for social, rather than biological organism. Opening #9: The Receptive Stance. In November of 2010, I flew to Denver for a working retreat with Art. The opening came early on in our working sessions. I have photo of the flip chart with the exact quote we wrote down when it came: “Composition requires creation of a negative space, i.e. receptors for an as of yet unknown interaction.” For so long we had been searching for some currency ontology, i.e. we were trying to figure out what the basic currency components were out of which we could build our flow language. This opening had us flip our attention, i.e. not to look for the parts, but to look at the negative space, the structure of containment that could allow for the rise of as of yet unknown parts. To close, as short story: I live in an intentional community. One of the things we’ve been doing here is lots of planting. For me, this meant that besides starting a terracing system to create a kitchen garden this year, I also planted four fruit trees: a cherry, two peaches and an apple. I decided to buy fairly large trees (not the less expensive bare root trees you can get) but ones that were already a good six foot tall with a root-ball, to get a head start. It felt like a good investment. Well, not more than a month after planting, the apple tree started leaning over in the wind. So I added some stakes and support to help stabilize it. A month later I found the tree almost lying flat. Examining it, closely I found that it was no longer a tree with roots, but rather more like a stake with branches jammed into the ground. Some critters had totally separated the growing trunk from all the roots. Turns out it was voles. Nearby the trees I had dumped a large pile of manure which was planning to spread in the spring. The warmth of pile is now host to a prolific family of voles, that apparently also took advantage of the soft earth that resulted from my digging a nice hole to plant the apple tree, and enjoyed the roots and bark of the tree in the mean time. So here are the voles again, intersecting with my life. But this time, oddly, something I did was giving them life, and to my expense! There is the economic farmer in me who’s frustrated and angry. Frustrated at the loss of a $50 tree, and wanting to just go get rid of those @&!#@* voles. But there’s someone else in me who’s laughing. I can’t quite name that person, but I feel like he/she’s laughing at a joke that’s on me, and it’s actually a good-humored joke. It feels like maybe that vole-chewed tree is part of a bigger pattern that I can’t quite see, but that person inside me can see it, and is chuckling at my farmer response to the vole. What is that pattern? I don’t know for sure. But what I am sure of, is that though I have to be responsible to facts of the current reality, at this stage, it’s essential that pay very close attention for openings through which I may be able to become responsible to emergent possibilities. Notice that ten out of twenty-two of the suggested grievances are either directly or indirectly about money. Hmmm. Interesting indicator of where the problem is. It’s fascinating to me how stuck we are with the idea that such grievances about money will be resolved politically. For example: grievance 1 & 2 call for reversing the supreme court decision that spending money is an act of free speech, because this allows corporations and rich people to control government through the “protected speech” of campaign contributions. That seems to make sense on the face of it. But the problem is, I believe that money actually is an expressive capacity, a speech act. So free speech does apply. But not quite the way it might at first seems. It’s not spending money that’s the speech act, it’s issuing it in the first place. You see, issuing money is making a promise. It’s make a declaration about value. Spending money just is passing along that promise or declaration that some other party made, because it’s a token of the value you wish to transact. If free speech really applies to issuance this has consequence for Occupy. A far better strategy, I believe, is to build on that Supreme Court decision, to take it further and make sure that we trumpet this truth. That real monetary speech comes from issuance, not spending. But we don’t have to wait for the courts to recognize this truth before we start acting on it. Communities and individuals everywhere can start issuing thousands of new types of currencies as acts of free speech. Currency issuance is already free because it is speech! There may be one political fight that comes from this view. Currently, legal tender laws force us to recognize Federal dollars for settling “all debts public and private”. This amounts to something akin to the opposite of free speech, the forcing of speech. I believe that you are free to speak as you please, to make any promises that you want. But this freedom of also entails, I believe, that I not be required to believe your promises. But this is what the legal tender laws amount to, citizens being required to believe the promises of government and the financial industry which together issue Federal currency. So perhaps one political battle worth fighting for is the repeal of the legal tender laws (which can be done on the grounds of freedom of speech), but I think better strategy is just to make it obsolete. One of the main issues of the Occupy movement is economic inequality. Whenever I think about it, I keep coming back to my watershed work. For me, economic inequality is a vital but secondary issue. The more fundamental issue is how should money ideally flow within an economy? I believe it should be recycled often to fall again and again as rain upon the slopes. What we are seeing is a concentration of wealth low in the watershed and how unproductive it is down there. Trillions of dollars in credit default swaps. What kind of truly human aspiration is that serving? Trillions of dollars being leveraged for what? One can argue that more of that money should be shared more widely in the name of economic justice. But I think there is a more politically powerful perspective of economic effectiveness. How pathetically little is being truly created by all the money that has flowed too far downslope. A failure of imagination is draining our culture of economic vitality. It’s not an issue of rich vs. poor but an issue of how possibilities drain away when wealth accumulates downslope. All of us, rich and poor alike, would be uplifted by a flow that recycled and held the wealth of our species higher in the watershed. I believe it is spiritually important to see this as a long-term issue, not of taxing the rich and giving to the poor, but of adjusting thousands of the ongoing flows within an economy so that the money keeps getting recycled back up to flow over and over again. In case you don’t know, his “watershed work” is literally work on watersheds. During rain storms he walks high up into the watershed with a trowel, and makes lots of small changes to redirect water flows from concentrating in gullies. 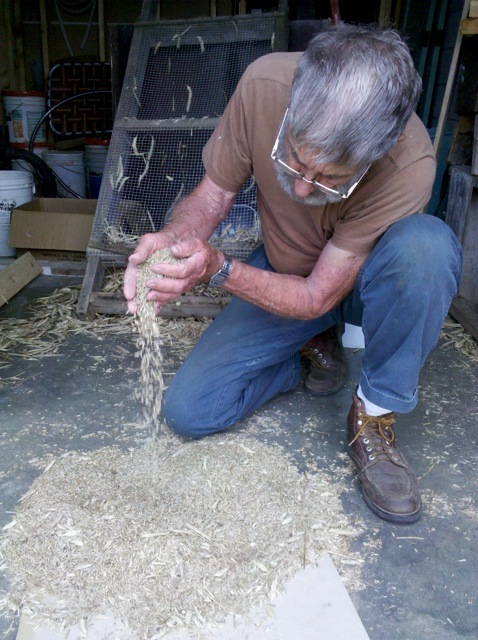 Paul has some fascinating photos of how this small work makes huge difference over time. Last fall I planted rye in the disturbed ground around my house to act as a erosion control. Just this week my father helped my harvest the rye. We took it into the basement and, with the kids, danced around on it to thresh the kernels out of the heads. From about 3 or 4 hours of harvesting and about 2 hours of threshing and then winnowing, all this manual labor produced about half of a 5 gallon bucket’s worth of rye. That same 20lb of rye purchased from my local Agway would cost around $15. So clearly, economically there’s an indicator that I should be doing something else with my 6 hours that harvesting and threshing rye, because even if I flip burgers for minimum wage, I’d make more money in that time period that I’d spend on the rye. It’s so experientially clear to me from this threshing that I did with my dad, that the low price per pound I pay for rye at Agway includes massive unaccounted for externalities, and it’s also clear that the benefits I receive from engaging with the land directly are much higher than can be encoding using only one dollar measuring unit. But this is in no way saying that I think everyone, or even me, should go “back to the land” and eschew specialization. I just want to really be able able express all those forms of value, and see those externalities, and stop pretending that they can all be reduced to one price. I’m re-reading Jim Corbett’s Sanctuary for All Life. I don’t know how to express how powerfully deep this book is. For me it both opens doors and provides a foundation for a post-civilized world for humanity. 1. The richest, most efficient, dynamically stable, “no-waste” economies evolve naturally, as spontaneous orders unmanaged by human beings (for example, the Amazonian rainforest). 2. A highly developed economy of this kind grows through the emergence of new symbioses that strengthen its ability to support life and harmonize diversity. 3. Founded on the premise that the earth belongs to humankind, civilized economies are degenerative, growing primarily from the impoverishment of the more inclusive natural economy that the city-centered economy invades, plunders, and relentlessly tries to subjugate. 4. “Sustainability” concerns the stabilization of the human economy’s degenerative relation to the natural economy at a level that the natural economy can support without further degradation. 5. “Symbiotic naturalization” concerns the integration of a human economy into the natural economy in ways that strengthen the natural economy’s ability to support life and harmonize diversity. 6. Unlike sustainability, symbiotic naturalization requires the transformation of civilization, to establish the institutional base for human beings to become good citizens of the land’s whole, untamed community, enabled to live by supporting rather than degrading the life of the land. 7. In our deliberations about right livelihood, the need to transform civilization means that we seek to be superseded, but not by a new humanity of ecosaintly Uebermenschen; rather, by an unviolated land community that includes us, freed to evolve into richer harmonies. 8. The integration of humanity into the natural economy necessarily evolves as a spontaneous order in which our stewardship role is just to clear the way, not to impose a plan. 9. The invisible hand that guides the natural economy’s evolution reveals that our best choices are transitional, our best intentions are disoriented, our personal moralities are peripheral, and the covenant community’s guidelines are inconclusive; but universal liberty is fundamental: The land’s liberation remains focal. …the problem with civilized humanity’s exploitation of nature goes beyond our treating it as a commons that is just there for the taking. The problem is rooted in the managerial delusion that the land belongs to us either inclusively, as a commons, or exclusively, as property, to use, degrade, or destroy however we like. The land is actually a living community to which we belong. … The tragedies of the commons and of appropriation will end only when the land community’s enslavement ends–when the land is given back to the land. Proponents of state control see the solution to the tragedy of the commons as a relinquishment of individual freedom to the state, which must take command in order to save us from ourselves. Yet, the local, daily, on-the-land, community practice that weaves earth rights into the social fabric is beneath the reach of the state, while the commons really at issue is the earth ecosystem, which is beyond the reach of any state but within the reach of a border-bridging community movement. A basic society of friends can join to establish earth rights where the cumulative efforts of individuals are fruitless and action by the state is counterproductive. Even if the state didn’t give its primary allegiance to Money, it couldn’t do what’s needed to give the land back to the land because what’s needed is the societal cohesion that grows from communion rather than coercion, and the state is firmly founded on organized violence. Locally as well as globally, land redemption is a task for those who gather as “church” (a voluntary society based on communion) rather than “state” (an involuntary society or organization based on coercion). At the core of his work, Corbett is trying to open a way-of-life in which we can realize that we belong to the land, rather than pretend that it belongs to us. He is trying to open doors to world in which rather than the command & control relationship we currently have as the land’s enslavers, that we might move to a co-creative one as a people symbiotically re-naturalized. This means that Land Emancipation must happen. That possibility is thrilling. Synchronisticly I had just seen an article on the “The game-based economy” which I think neatly illustrates Arthur’s point. Look closely at what “gamification” actually means in the case studies. It’s the introduction of wealth acknowledgment token systems that account for the wealth being generated by a “game.” Each one of them is actually a different form of a “current-see,” a formal information system that lets the players see the particular current(s), or flow(s) that they can then interact with in particular ways to generate the overall intended outcome of the game. Who is limited in the creation of such current-sees? Nobody. You just do it. (ie. the true meaning of LETS!) But doing it will be much easier if there is an widespread expressive capacity, i.e. a “meta-language” in which to specify and describe the current-sees. The creation of that meta-language, to my mind, is the task of our movement. Imagine it’s 3000 years ago and you hear all this griping about the unfairness of those temple scribes who have control of the pictograms. It’s just not fair! The scribes totally abuse their power, they tax us more and more for each letter we want to send, etc.. But we’ve finally understood that their pictograms really aren’t sacred, they’re just arbitrary symbols, any of us could make up our own set and send letters to our families! We should have the right to to do this without the temple thugs coming to get us! And then when you dig deeper you do see that, even though they’re an elite class, they do serve an important function (maintaining the consistency of meaning) by keeping tabs on each pictogram and making sure they’re drawn correctly etc. And yeah you see that maybe not everybody should be allowed to create pictograms and write with them. Just imagine all the chaos that would ensue if just everybody created their own different drawings for each word. Because then we have to deal with competing meaning systems and maybe we’d better just have one symbol set to learn because that’s more efficient for the scribes because after all, we can’t all spend the time it takes to learn all 100,000 pictograms for all of our words! That’s why there are scribes in the first place! So maybe we can just start a complementary pictogram (cp) system for the couple thousand words we use here locally! Yah! Let’s do it! And in some places the local temples are cool with that, and in others it’s O.K. as long as you use them only to talk about non-temple business, an in other places they see any different pictograms as a threat and ban them. So then the talk of the cp movement is all about what the laws are in different temple jurisdictions and how to get people to start signing on to new pictogram systems instead of going down to the temple for all their writing needs.. etc.. etc..
And then someone invents the alphabet, a new expressive capacity that completely by-passes the functional reason for centralizing that power to the scribes in the first place. The alphabet makes it truly practical for everyone to learn to read and write because they only need to learn a handful of symbols. Any kid can (and will) do it. I hope you see how the story above is almost isomorphic to the current financial situation with its elite. And how many of the questions and concerns that people have about community currency relate: Worries about the nation state thugs shutting things down. Questions about what happens if any individual can issue currency. Anger at the banks for monopoly issue, etc. These are all structurally the same as those worries about the scribes. And for structurally the same reason with the same structural solution. An information system was centralized that no longer needs to be when a new expressive capacity at a higher meta-level makes universal “literacy” possible. Everybody issuing their own current-sees isn’t like everybody creating their own 100,000 picture pictogram system just because they can. It’s like everybody learning a new “wealth alphabet” in which they can begin to speak wealth-acknowledgments to each other in new useful systemic patterns that reveal the flows in communities that actually build wealth. Literacy is a necessary precursor to democracy in large scale societies. We live in the age before any wealth-acknowledgment-alphabet exists. Thus the political freedom made possible by democracy is not possible in the economic realm. When the wealth-acknowledgment-alphabet comes into existence, then, and only then, will a new form of true economic democracy become possible.